Right in time for Valentine’s Day, the Supreme Court of Pakistan has sent Prime Minister Yousaf Raza Gilani a love letter – in the form of charges for contempt of court. That handwriting had been on the wall for weeks now, but was sealed with a kiss on Friday, when a bench of the Court led by Chief Justice Iftikhar Muhammad Chaudhry denied Gilani’s appeal to dismiss the contempt notice served upon him last month. The appeal hearing itself appears to have been a stormy affair, with Chaudhry and other judges reportedly “almost shouting” at Gilani’s lawyer, Aitzaz Ahsan – who happened to serve as the Chief Justice’s own lawyer during the happier days of the lawyers’ movement back in 2007. “How can you being a senior lawyer write this?” snapped the Chief Justice. “We are very embarrassed by remarks [in your filing].” He apparently closed the hearing by simply saying, “Sorry, Aitzaz.” (With great warmth and affection, I am sure.) If Gilani is convicted of contempt, that almost certainly will disqualify him from serving in Parliament and, therefore, lead to his ouster as Prime Minister. How did Pakistan find its way to this lovefest? At issue in the contempt case is the government’s unwillingness to fully implement the Court’s 2009 judgment invalidating the National Reconciliation Ordinance, an order promulgated in 2007 by then-President Gen. Pervez Musharraf granting amnesty to thousands of bureaucrats and politicians charged with corruption and other offenses in the years before Musharraf’s 1999 coup. The NRO was born out of a U.S.-brokered courtship between Musharraf and former Prime Minister Benazir Bhutto in 2007, when the lawyers’ movement was ascendant, Bhutto in self-imposed “exile,” and Musharraf’s own grip on power slipping away. (Geo TV’s romantic imagining of the Musharraf-Bhutto courtship can be seen here. Rest assured that the video is SFW; Musharraf does not take off his uniform.) Channeling its inner desi auntie, the Bush Administration was determined to play matchmaker, hoping that by arranging the political marriage of Bhutto to its loyal friend Musharraf, it could help Musharraf stay in power. But for Bhutto to be willing to return to Pakistan, she wanted Musharraf to drop corruption cases against her and her husband, Asif Ali Zardari, arising from her tenure as Prime Minister during the 1990s. Needless to say, Bhutto’s leading rival, former Prime Minister Nawaz Sharif, felt rather jilted by these developments – since only the previous year he and Bhutto, along with the leaders of thirteen other civilian political parties, had signed and agreed to the Charter of Democracy, a preconstitutional declaration which explicitly pledged it signatories not to cut side deals with the military that might advance their own political fortunes but undermine democracy by sustaining the military’s political power. (My thoughts at the time about the Charter of Democracy and the Musharraf-Bhutto courtship can be found here and here.) And rather than raise Musharraf’s popularity, Bhutto’s own standing took a tumble. As it happened, the relationship between Musharraf and Bhutto fell apart, but the NRO became law anyway, granting amnesty to thousands of individuals, including Bhutto, Zardari, and other senior politicians in Bhutto’s Pakistan People’s Party. Almost immediately, the Supreme Court suspended the NRO’s operation, and eventually – after an extended saga that, to refresh your recollections, included (1) Musharraf’s extraconstitutional state of “emergency”, during which he ousted two-thirds of Pakistan’s superior judiciary, cracked down on political opponents, and purported to amend Pakistan’s constitution to preserve his ability to serve as president, (2) Bhutto’s assassination and Zardari’s ascension to become co-chairman of the PPP, (3) elections in February 2008 which decisively repudiated Musharraf and brought a PPP-led government to power, (4) Musharraf’s resignation, and the ascension of Bhutto’s widower, Zardari, to the presidency, and (5) the new civilian government’s eventual (though fitful) restoration of the judges ousted by Musharraf in March 2009, following continued pressure from the lawyers’ movement and Sharif – eventually, after all of that, the restored Supreme Court issued a final judgment invalidating the NRO in December 2009. The government has dragged its heels on fully implementing that judgment, balking in particular at the Court’s order to write Swiss officials to reinstate an earlier request seeking assistance in pursuing corruption cases against Zardari under Swiss law – a letter that apparently had been withdrawn, owing to adoption of the NRO. Now, the Court has become “intellectually emotional” about the government’s refusal to implement its 2009 judgment. In January, the Court enumerated six “unpleasant” options that it was weighing to address the government’s recalcitrance – ranging from outright disqualification of the President and Prime Minister for violating their oaths of office or the initiation of contempt proceedings against the Prime Minister, at one end of the spectrum, to leaving the matter in the hands of Parliament or the people, at the other. In between, the Court floated the idea creating a commission to monitor implementation of its order. The less severe options might have exposed the Court as incapable of fully enforcing its order. But as a practical matter, the Court faces that prospect anyway, since it seems likely that no matter what it does, there will be no effective effort to revive the proceedings in Switzerland before the applicable limitations period runs. 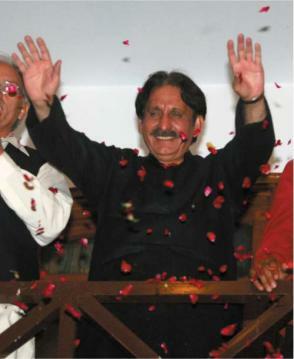 In that light, perhaps avoiding the smackdown that is about to ensue would have been a good enough reason for the Court to exercise the passive virtues in this instance and instead move on, as human rights lawyer Asma Jahangir has suggested, to take up the “thousands of other pending cases” that will necessarily get put on the back burner because of this soap opera. For its part, why won’t the government simply write the letter to Swiss officials and put this game of chicken to an end, as Jahangir also has urged? Formally, the government has argued that it cannot do so because now that he is President, Zardari is constitutionally immune from criminal prosecution. More likely, the move is simply calculated to protect Zardari from legal exposure – and to at least try to avoid the political hit that would result from going on record to request criminal charges against its own head of state and party co-chairman. At this point, however, as a practical matter that political hit may be hard to avoid no matter what happens. So both the government and the Court appear to have staked out the most aggressive positions possible when it’s not entirely clear how much either side will gain in the end from doing so. And the NRO case is only one of several recent instances in which the Court has been clashing with the government over highly charged political issues – including the Court’s implicit invalidation of Parliament’s constitutional amendments to the judicial appointments process in 2010 and its current investigation into the so-called Memogate scandal, which has put the civilian government directly in the crosshairs of the military. While the Supreme Court during Chaudhry’s tenure has asserted its autonomy from the military, that has not by any means been the Court’s traditional approach – to the contrary, Pakistan’s superior judiciary has a much longer tradition of acquiescing and validating the military’s extraconstitutional moves to usurp power from civilian rulers. [W]hat are the consequences of the SC deciding the eligibility of politicians on the intellectually tenuous grounds of dishonesty or being ‘ameen’ or a violation of the latter’s oath? And of disqualifying prime ministers, removing presidents and ordering regime change on other grounds? This order signifies a possible transition from a judicially activist court to one that follows the jurisprudence of a legal empire. This new jurisprudence signifies that it is the SC which will determine what an honest/ameen democratic system should look like. . . . This possible transition to a legal empire is based on the misleading presumption that the panacea for all major problems facing the democratic system lies in the laws and judicial system. Sadly, neither our history nor a comparative political analysis of other countries proves such a legally biased thesis. What is required is a strong democratic constitutionalism determined by politics, the law and the legitimate use of force. Yes, action should be taken for contempt but no institution should presume a monopoly over democratic integrity and wisdom. The Court’s defenders respond by noting that even as it has challenged civilian politicians, it simultaneously has been standing up to Deep State interests as well. And indeed, in recent days the Court has moved forward on two sensitive cases involving the Inter-Services Intelligence Directorate. Still, many observers are skeptical that the Court will manage to be genuinely evenhanded in its treatment of civilian versus military interests over the longer term. However weak the military might seem on the surface right now, the Deep State’s tentacles run, well, deep. If Pakistan’s politicians and judges are unable to fashion a workable modus vivendi to consolidate democracy and constitutionalism, in the same spirit as the Charter of Democracy, there’s certainly no guarantee that the country won’t eventually find itself caught in a bad romance with military rulers once again.